Hortus Camdenensis | Cunninghamia lanceolata (Lamb.) Hook.f. Fully-hardy, evergreen conical tree, developing a rounded top with age, with glossy, irregularly lance-shaped leaves, to 7cm long, with 2 white bands beneath, and ovoid to conical green-brown female cones, to 4cm long. To 20m. [RHSE, Hortus, Hilliers']. ‘Mr. Salisbury called the genus Belis, a name that has been considered too nearly allied to Bellis, and hence originated that of Cunninghamia, given by Mr. Brown, to commemorate the merits of Mr. James Cunningham, “an excellent observer in his time, by whom this plant was discovered; and in honour of Mr. Alan Cunningham, the very deserving botanist who accompanied Mr. Oxley in his first expedition into the interior of New South Wales, and Capt. King in all his Voyages of Survey of the Coast of New Holland.” […] It was introduced from China to the Royal Gardens at Kew, in 1804.’ [BM t.2743/1827]. 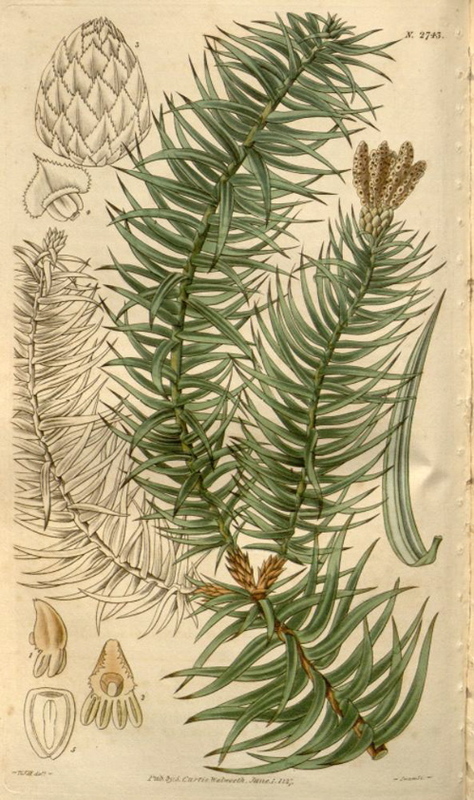 Listed in the 1845, 1850 and 1857 catalogues under the name Cunninghamia lanceolata [C.25/1845]. Araucaria lanceolata was included in brackets in the 1845 edition. It had probably been grown since before 1843 as it was listed in the 1843 catalogue only under the name Pinus lanceolata.